At this juncture, Trump took control of the meeting and shed light on the economic and strategic underpinnings of his diplomatic initiative. Trump was referring to the Nord Stream 2 gas pipeline that will connect Russian natural gas sources to Germany’s consumers, which will have a negative impact on Ukraine’s finances because its pipeline would thus be sidestepped. The president may also be concerned about the impact that the pipeline will have on exports of American liquefied natural gas exports. Stoltenberg: “You know, NATO is an alliance of 29 nations, and there are sometimes differences and different views, and also some disagreements. And the gas pipeline from Russia to Germany is one issue where allies disagree. But the strength of NATO is that despite these differences, we have always been able to unite around our core task, to protect and defend each other, because we understand that we are stronger together than apart. Trump continued to press Stoltenberg. “Now, this has been going on for decades. This has been brought up by other presidents. But other presidents never did anything about it because I don’t think they understood it or they just didn’t want to get involved." Trump continued, “But I have to bring it up, because I think it’s very unfair to our country. It’s very unfair to our taxpayer. And I think that these countries have to step it up not over a 10-year period; they have to step it up immediately. Germany is a rich country. They talk about they’re going to increase it a tiny bit by 2030. Well, they could increase it immediately tomorrow and have no problem. I don’t think it’s fair to the United States. “So we’re going to have to do something because we’re not going to put up with it. We can’t put up with it. And it’s inappropriate. “So we have to talk about the billions and billions of dollars that’s being paid to the country that we’re supposed to be protecting you against. You know, everybody is talking about it all over the world. They’ll say, well, wait a minute, we’re supposed to be protecting you from Russia, but why are you paying billions of dollars to Russia for energy? Why are countries in NATO, namely Germany, having a large percentage of their energy needs paid to Russia and taken care of by Russia? Stoltenberg: “Because we understand that when we stand together, also in dealing with Russia, we are stronger.” The NATO diplomat then said that NATO allies continued to trade with Russia even during the Cold War. Trump dismissed the comment, saying that “energy is a whole different story” and that Poland has not signed off on the deal. Trump met with German Chancellor Angela Merkel later in the day. The president said they had a “great meeting” where they discussed trade and military spending. For her part, Merkel said they exchanged views on migration and trade. “We are partners, we are good partners, and wish to continue to cooperate in the future,” said Merkel. Germany remains Europe’s largest economy. Trump told NATO leaders that they must double defense spending, from a target of 2% of GDP by 2024, to 4% of GDP, according to White House Press Secretary Sarah Sanders. A poll conducted by the Pew research organization found that nearly half of Americans feel that NATO does too little, even though their counterparts in Europe feel differently. In the U.S., 78 percent of Democrats polled in 2017 were favorable toward the alliance, as opposed to only 48 percent of Republicans. 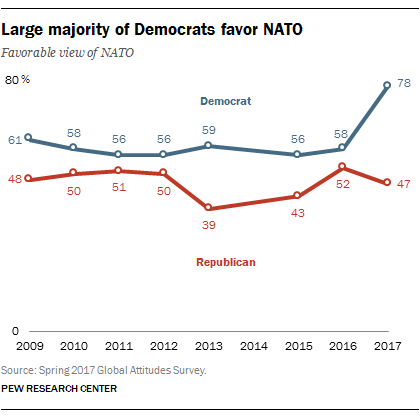 In 2015, the Pew research organization noted that there were sharp differences between congressional Republicans and Democrats over NATO and the threat posed by Russia during the Obama administration. A Pew survey showed that two-thirds of congressional Republicans saw Russia as a military threat, as opposed to only 56 percent of Democrats who shared the concern. Half of Republicans said Russia was to blame for the war in eastern Ukraine, only 39 percent of Democrats agree. In advance of the July 16 Trump-Putin summit in Helsinki, some Democrats continued to ventilate the unproven accusation that Trump somehow benefited from Russian election meddling in 2016 and will therefore favor Russia in the coming negotiations. Let this sink in. Today, Senate Intel found Russia interfered in our election w/ a preference for @realDonaldTrump. Yet, @SenateGOP leaders were in Moscow cozying up w/ Russians and Trump wants a private meeting with Putin. If they can’t confront Russia, shouldn’t they just stay?